September is here, and Mother Nature is wrapping up summer here in Milwaukee. After a busy August, I now am back in school (I teach at Milwaukee School of Engineering) and catching up on chores around the house whenever I can fit them in. About two weeks ago the big drama on my street was a baby cardinal that had possibly ventured away from the nest prematurely. All afternoon the baby bird landed in the strangest spots, like on top of the Sudoku puzzle my neighbor was working on, right on the table in front of her on her patio. The parents were never far away, chirping different but rarely varying messages to their offspring. It sounded like they were encouraging it to try its wings again, just as we cheer on kids learning to ride their bikes. Eventually the baby bird made it all the way down to a duplex at the end of our block, a journey that had taken hours of close supervision from Mom and Dad. Below is a photo I took in the early evening of our exhausted little adventurer. In the upper left, you can see Mom perched on a thick line that remained stable under her weight. Poor Mom. She kept trying to land closer to Junior, but those thinner lines swayed too much every time she attempted to perch on one. 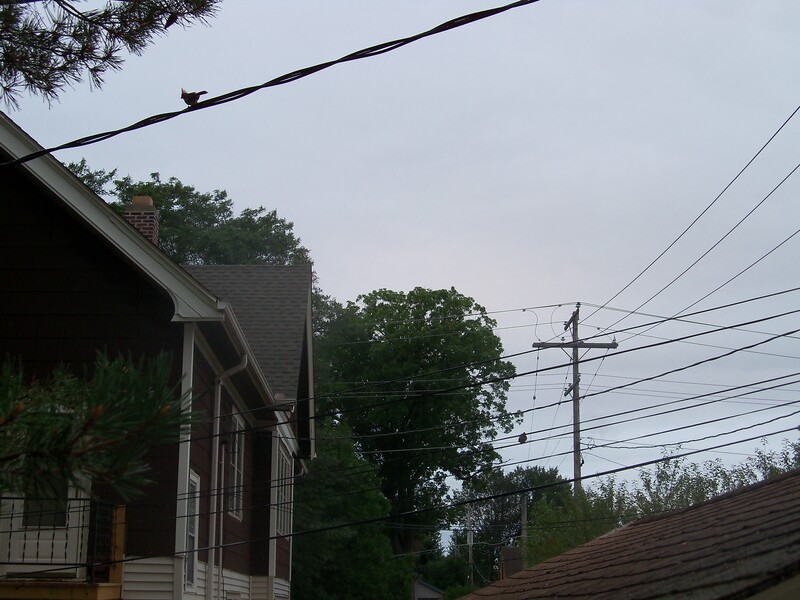 In the lower center-right of the photo you can see the baby bird sitting on a much more slender strand of wire above the garage. It was a breezy evening, but the little bird didn’t seem to be bothered. It just swayed along with the wire. Meanwhile, the poor parents kept flitting and chirping incessantly. Below are some other photos I took to document the end of summer in Milwaukee. Here we see the flowery finish of our mint plants. Some of our mint plants, I should say. 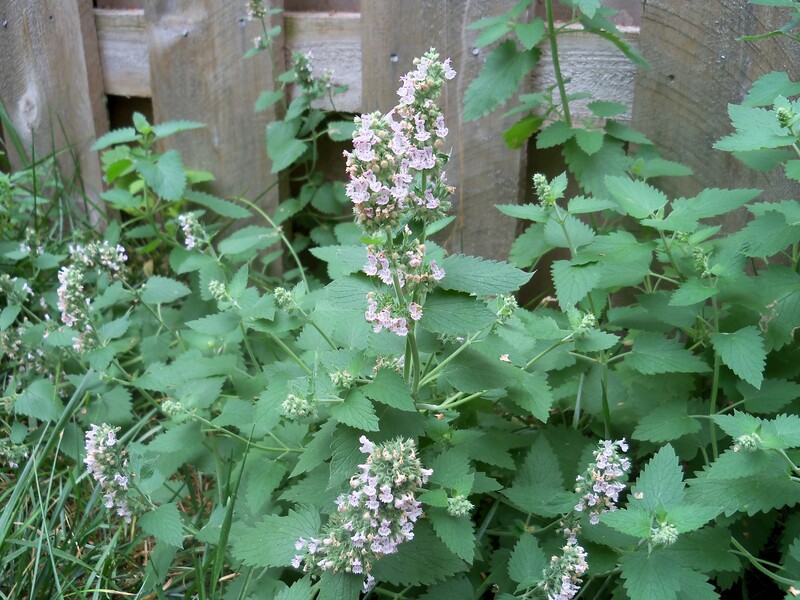 Mint is a tireless volunteer, reseeding itself all over the place. 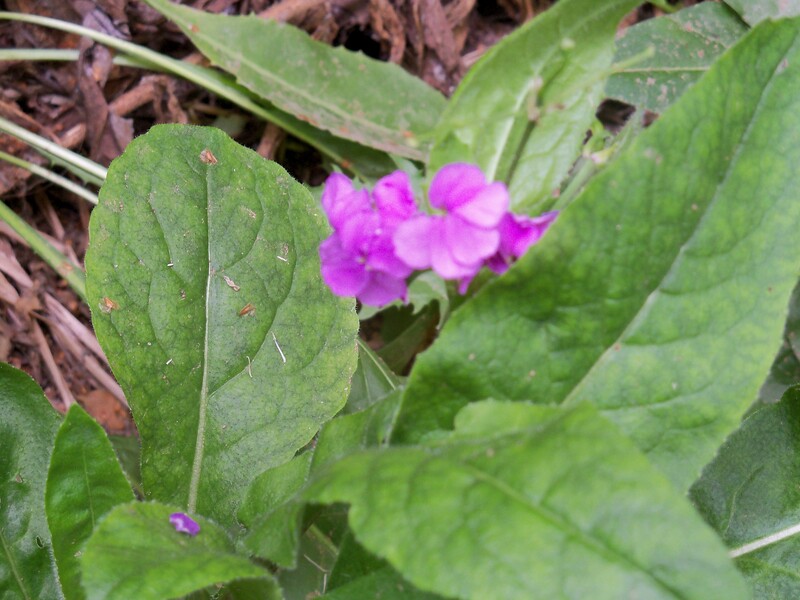 The phlox bloomed once in early June, but new growth is trying for one last burst of color. The old silver maple is already anticipating autumn. 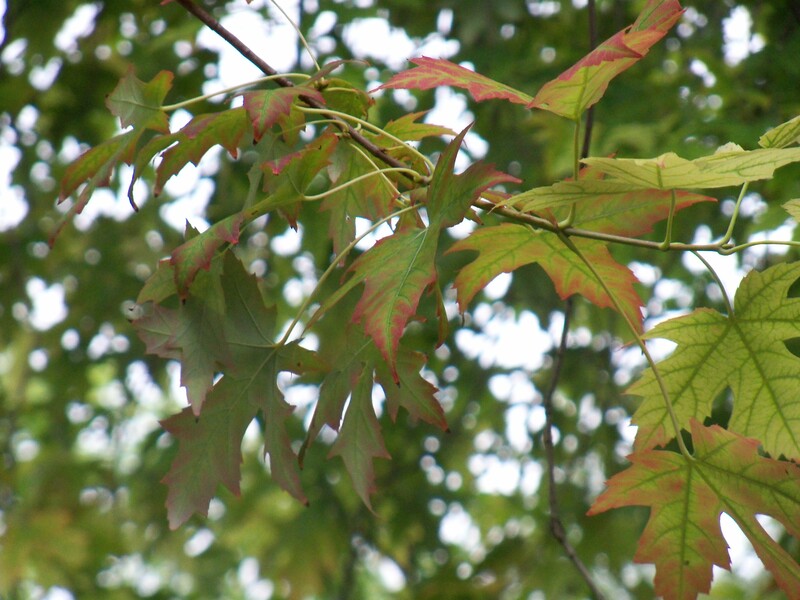 Its leaves are beginning to get tinged with red. 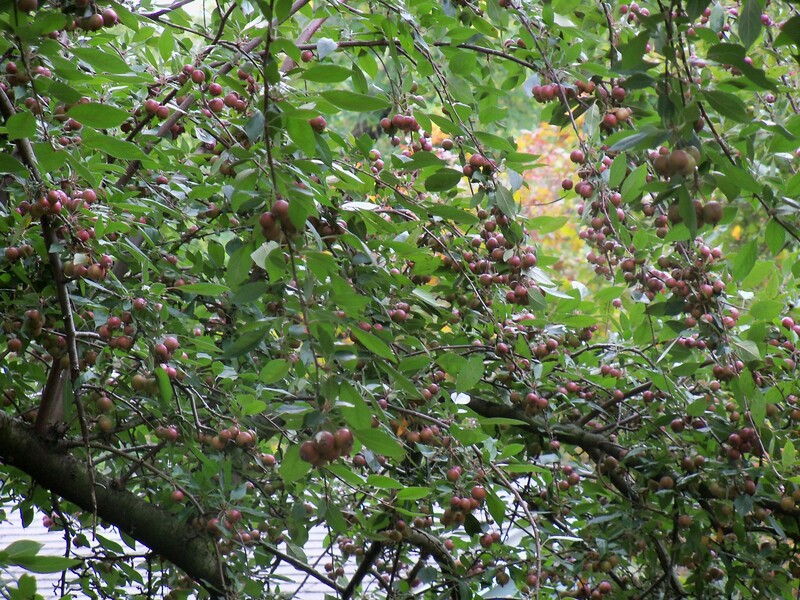 And the crab apples! My neighbor keeps telling me I should make jelly out of them. We certainly could make a project of it. 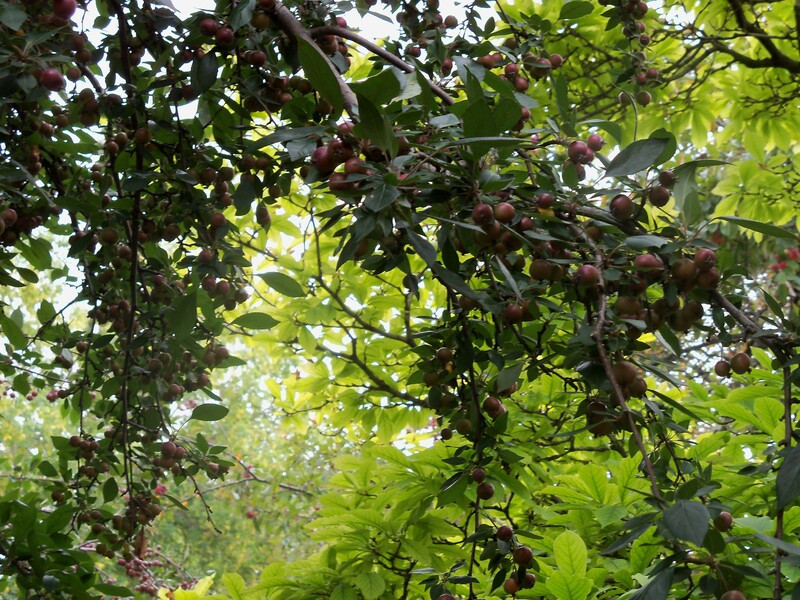 We have lots of crab apples. LOTS of crab apples . . . This entry was posted in Life, Milwaukee and tagged autumn, autumn leaves, baby birds, cardinals, leaving the nest, mint, mint plants, nature, outdoors, plants, seasons, September, silver maple tree. Bookmark the permalink. The pictures are great. I hope all ended well for the little bird. Finding beauty in ordinary things is a gift. There is beauty everywhere around us. We sometimes think it must be hidden, but if we only open our eyes, we can see it everywhere. You’re right. Most of the time we are probably too busy or distracted to appreciate everything around us. Hello, san! Yes, you may have some crab apples. We still have PLENTY hanging on the tree waiting to fall.